I’ve become an expert on how to increase economic inequality, and I’ve spent the past decade working hard to do it. Not just by helping the 2500 founders YC has funded. I’ve also written essays encouraging people to increase economic inequality and giving them detailed instructions showing how. So when I hear people saying that economic inequality is bad and should be decreased, I feel rather like a wild animal overhearing a conversation between hunters. But the thing that strikes me most about the conversations I overhear is how confused they are. They don’t even seem clear whether they want to kill me or not. . .
And that group presents two problems for the hunter of economic inequality. One is that variation in productivity is accelerating. The rate at which individuals can create wealth depends on the technology available to them, and that grows exponentially. The other problem with creating wealth, as a source of inequality, is that it can expand to accommodate a lot of people. Most people who get rich tend to be fairly driven. Whatever their other flaws, laziness is usually not one of them. Suppose new policies make it hard to make a fortune in finance. Does it seem plausible that the people who currently go into finance to make their fortunes will continue to do so but be content to work for ordinary salaries? The reason they go into finance is not because they love finance but because they want to get rich. If the only way left to get rich is to start startups, they’ll start startups. They’ll do well at it too, because determination is the main factor in the success of a startup. And while it would probably be a good thing for the world if people who wanted to get rich switched from playing zero-sum games to creating wealth, that would not only not eliminate great variations in wealth, but might even exacerbate them. In a zero-sum game there is at least a limit to the upside. Plus a lot of the new startups would create new technology that further accelerated variation in productivity. . .
You do not want to design your society in a way that’s incompatible with this curve. The evolution of technology is one of the most powerful forces in history. And he continues. I won’t bore you with the rest (although you’re welcome to read the essay in its entirety by following the link above). Suffice it to say, Graham believes that he and other high-tech investors and CEOs are the ones who, through their own hard work and determination, create most of the wealth and deserve the largest share of it. I found the conversation a bit disconcerting. Yes, income inequality exists and yes it’s a natural consequence of capitalism and other forms of government are decidedly worse than capitalism because they inefficiently create and allocate resources. But the celebratory nature of today’s conversation felt tone deaf and seemed to ignore the rules that get bent in favor of those with resources or born into privilege. So instead of celebrating income inequality perhaps we would be a bit more compassionate about it. 1. Founders start companies. They get huge tax breaks for doing so. They get to have “long-term capital gains” taxes which are much lower than short-term capital gains taxes paid by people who have stock options or income taxes paid to workers. In the old days this may have made sense since founders took huge economic risks and often refinanced houses or built companies with almost no money. These days founders often raise money with minimal time spent creating a company and often have salaries from the early days. I’m sure the tax gains of founders is dwarfed by the economic gains made by merely creating a company – but it is worth at least pointing out that this tax break exists. It is seldom ever mentioned. 3. Both of these privileged, very small group of people in 1 & 2, have much better tax rates than say, the third employee at a startup who might have joined 3 months after the founders. That employee was given “stock options,” which pay the exact same rate of taxes as income. In California considering state, federal and local taxes that can be as high as 56%. Think about it – if the first two employees work 6 years and sell a company while employee 3 works 5 years and 9 months … should they really pay grossly different tax rates? Of course if an employee “exercises” his or her options AND holds the stock more than one year then they are eligible to earn long-term capital gains. But this often requires relatively large sums of money and it implies writing a check in a company whose future is uncertain. That might actually seem fair. But ask yourself why employee three (and four and four hundred) has to write the check while employees 1 & 2 do not? 4. Luckily many, not all, tech employees in Silicon Valley earn good wages as a result of educations from top schools that allowed them access to this talent market. So if one works for several years at startups one can acquire wealth afforded to accomplished individuals. As a free-market capitalist this is as it should be and of course this in its own right creates a degree of income inequality that is tolerable. So these people invest some of their income in stocks. If they choose companies who pay high dividend rates they can accumulate wealth with lower taxes because dividends pay lower taxes than income. If they keep their hard-earned money in the stock market they can one day sell their stock and pay much lower taxes because – again – long-term capital gains pay lower tax rates. 5. Finally, if one is lucky enough to leave ones money in the stock market over the long-term this tends to yield better results than many other investment types. But. The system can be juiced in favor of capital over labor. How? Well, when corporations make profits they have lots of decisions about what to do with those profits. They can expand operations and hire more people creating more wealth for a larger pool of people. They can increase worker wages and hire more employees, which benefits labor. They can pay dividends as outlined above, which is paid a lower tax rate to people who have investment dollars. And they can buy back stock. With fewer shares in a company the price per share goes up and those that own stock in the company own a larger, usually more valuable stake. It’s a form of compensation from company to shareholders. And you guessed it – it benefits both people with large amounts of capital and those pay smaller tax rates than secretaries or any average worker in the company. For Suster, it’s not just hard work and determination. Those at the top also enjoy a series of tax breaks the rest of us don’t have access to. And he’s worried that glibly celebrating inequality might have adverse consequences for their own place at the top. Here’s what I find interesting in this exchange: while Graham celebrates the increase in inequality and Suster reveals some of the tax advantages those at the top are able to avail themselves of, neither seems to be able to imagine that workers—whether in the Silicon Valley companies they own or manage or in the outsourced companies where the coding and the production of high-tech gadgets take place—actually create the extra value investors, CEOs, and others manage to rake in. That’s what the members of the Silicon Valley elite—and, for that matter, the economic elite in the country as a whole—ignore or overlook in their discussion of inequality. They really do believe that they create jobs through innovation and deserve to be rich (Graham), and in addition benefit from enormous tax breaks others don’t (Suster)—but, either way, they want to hang onto what they see as a libertarian high-tech startup environment that serves to “unleash our societal potential.” And they steadfastly refuse to see the role played by all the others, the workers who are forced to have the freedom to work directly or indirectly for one of their startups and are left behind as the value captured at the top continues to grow. What they reveal, and what Ferenstein confirms, is that the Silicon Valley investors and CEOs really do believe they alone are responsible for the growth of wealth attached to their companies. And if the gap between the top and bottom is growing, it’s because those at the top are that much more productive. They all get what they deserve. So, yes, the members of the elite do in fact see the growing inequality, in their own counties and cities as well as in the country as a whole, but they can’t see that the current set of economic arrangements systematically rewards a few at the top based on the work performed by everyone else. fundamentally, Paul Graham is not much of an outlier among Silicon Valley’s elites when it comes to the relationship between ability and financial rewards. Most successful technology moguls know better than to be as blunt as Graham, but deep down a lot of them believe that a small minority — like them — create a hugely disproportionate share of the world’s wealth. 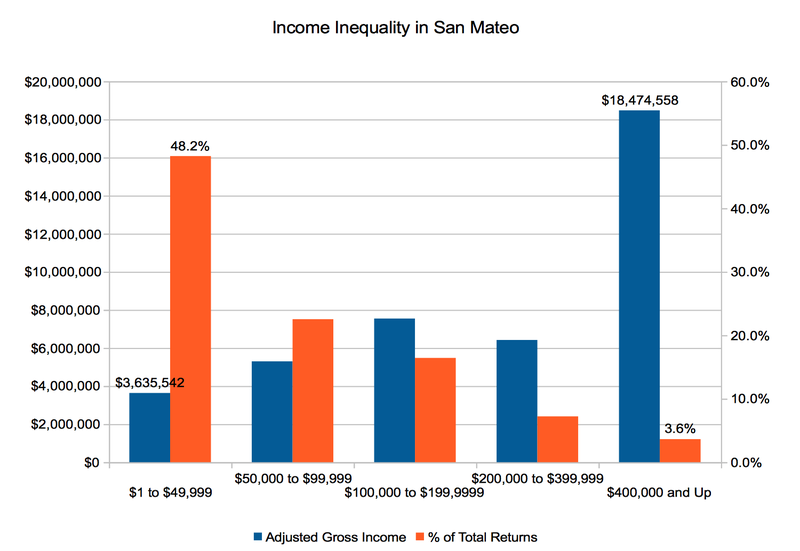 *In San Mateo the top 3.6 percent claimed over $18 billion in income, or 48 percent of the county’s total income pie. Meanwhile the bottom 48 percent made by with only $3.6 billion in income split among themselves. For the bottom 48 percent the mean income level was $22,000. The top 3.6 percent had a mean income of $1.5 million. 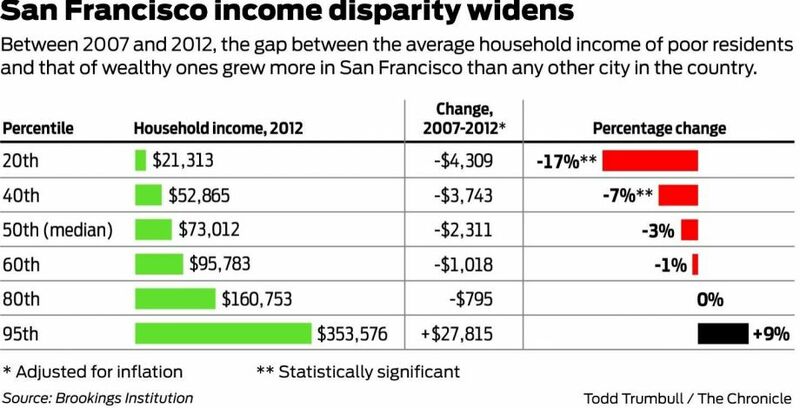 **San Francisco comes out on top when comparing the 2012 ratio between what the rich and poor earn (16.6) to the same ratio from 2007 (12.7). No other city saw the gap grow that much. It was a bad night for Democrats—and for neoclassical economists. But it’s also true that neoclassical economists—the group of economists who oppose minimum wages—also lost last night. Voters in all five states that had ballot initiatives to raise the minimum wage above the federal level and their current state levels approved the initiatives. All four states passed the measures, most by significant margins. More than two-thirds of voters in Alaska agreed to raise minimum wage to $9.75 by 2016. Sixty-five percent of Arkansas voters set the state on course to adopt an $8.50 figure by 2017. 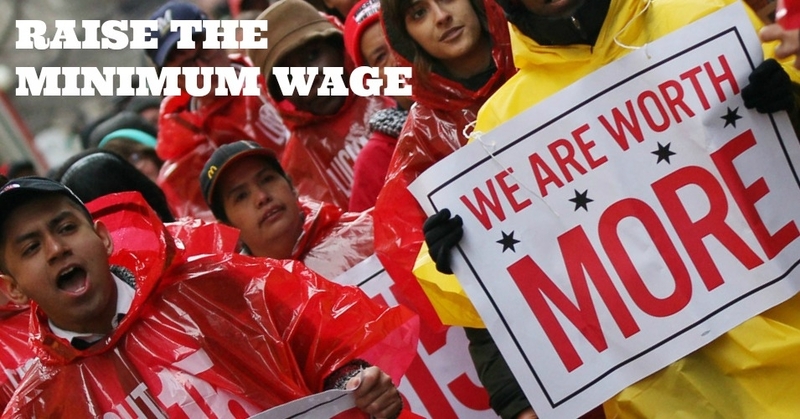 In Nebraska, 59 percent said the number should be $9 an hour by 2016. Only South Dakota stood out with a slimmer margin; 53 percent voted to raise minimum wage to $8.50 an hour next year. In Alaska and South Dakota, minimum wage is now pegged to inflation, meaning that it will rise as the cost of living does. And the fifth state, Illinois, where the ballot initiative was non-binding, also approved the measure—by 67 to 33 percent. In addition, voters in San Francisco decided to start paying workers a nation-high $15 per hour and Massachusetts voters passed mandatory paid sick leave. All in all, last night was a pretty bad night for neoclassical economists. I know: it’s actually a table not a chart. But I don’t want to create a new category. . .
Marlon G. Boarnet et al. [pdf] show that, in the Bay Area, average grocery wages are about 60 percent higher than Wal-Mart wages. Moreover, converting the benefit packages into hourly wage equivalents, total compensation at unionized Bay Area grocery firms rises to about double that typical for Wal-Mart. The conclusion: low wages and benefits are the high cost for Wal-Mart’s low prices.